You do not need to book if you are a campervan or small group. You only need to book if you are a school/DOE group or more than 12 people. Cost is $7.50 per adult, $5 per school child, $20 family 5 members. Cash please as I have no card facilities. Scroll down to see a booking calendar. The calendar is indicitive only. Use the small arrow (top right) to see future months. The Whatipū Campground contains numerous spacious, flat campsites. In peak camping periods we do get busy but to-date we have not been full. As there are no allocated camping sites, the campground operates on a 1st in, best spot, basis. The campground facilities are simple. There is no electricity or hot water. There are three composting toilets, two cold showers and several water taps. Drinking Water | The best drinking water is from the tap at the toilet block in the public carpark area. This water, whilst it has a sign from Auckland Council saying, 'This water is untreated. Ministry of Health recommends boiling untreated drinking water', it is piped from Whatipū Lodge and is filtered - it is our drinking water. The campground water is unfiltered and comes direct from the Gibbons Stream, high in the forested hills. Being surface water it can become discoloured after prolonged or intense rain. Please bring your own drinking water supplies. Winter camping | The lower campground is closed during the wet season. The lower campground is prone to flooding during heavy rain. Mobile homes | Large camper vans must take care crossing the narrow access bridge. Swing wide to line up the bridge and do not turn until the entire vehicle has passed the gate. Campers need to be fully prepared with all necessary camping equipment, stoves and cooking utensils. The nearest shop is at Huia, 10 kms from Whatipu. There is no electricity in the Campground and open fires and fireworks are NOT permitted. In a Rural Fire District, such as Whatipū, all fire suppression costs can be billed to the person who started the fire. Charcoal and wood burning cookers are not permitted. Gas cooking only. Campers need to take ALL rubbish home with them. Please check for bottle caps and cigarette butts. Swimming | There is no surf patrol at Whatipū beach. Auckland Council warn against swimming. Special care should be taken when fishing or exploring around the Ninepin (rocks with navigation beacon on the top) and Paratutai Island on the far left of the beach. There can be sudden large waves and dangerous currents. Please take note of when high tide is from the information centre. Noise | To ensure all campers enjoy their time at Whatipū, noise in the Campground must be kept to a considerate level, especially after dark. After 10pm please restrict noise to a level so other campers are not disturbed. Dogs | Whatipū is a Scientific Reserve and dogs are banned from the beach and wetland. For this reason there is a ‘No Dogs’ policy at the Lodge, Bach and Campground, which is strictly enforced. You will be asked to leave if you have a dog or other pet. DO NOT ENTER THE WHATIPŪ LODGE DRIVEWAY. Go straight to the campground through the Whatipū Beach public carpark, continue on the road towards Whatipū Lodge and cross a small bridge into the camping area. The gate will not be locked. 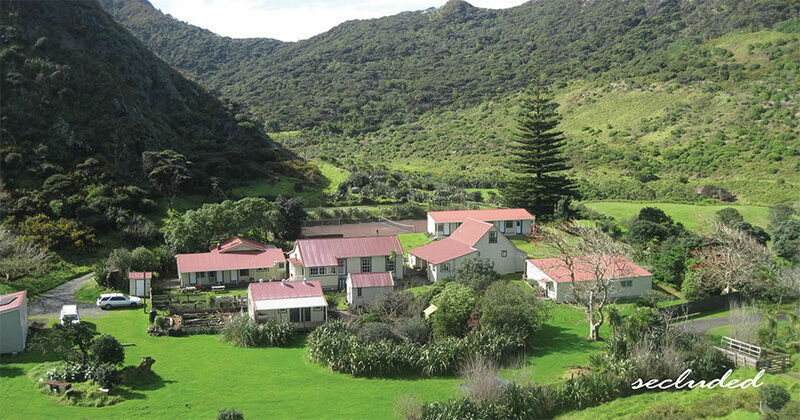 There is no need to come into the Whatipū Lodge grounds as someone will come around each day to collect the camp fees. Please only enter the Whatipū Lodge grounds for urgent matters or emergencies. Remember to bring your sunscreen, bug spray, torch, first aid kit, camera and suitable clothing for changeable conditions. Campers should be familiar with guidelines for safety in the New Zealand outdoors.